Mike’s Bibingkang–Ya’ Gotta Love the beer glasses doing double duty as wine glasses! Bibingkang? Nope! Never heard of it! Until a couple weeks ago when one of my younger cylcing friends, Mike S., told me he had been recently inspired to prepare it for the special lady in his life. I was inspired by his ambition, but also very, very afraid for him. That’s because trying to replicate ‘traditional’ ethnic dishes is very dangerous territory. Why? Because most traditional dishes have evolved over centuries and many generations to have a unique ‘character’ and taste that came from tinkering with the family recipes to create each ‘family’s version of the traditional dish’. Anyone from the outside the family trying to duplicate years of recipe evolution is indeed taking on a daring road. And a daring road it was. In his search for some of the unusual ingredients, Mike wrote, “I went to one of the Asian grocery stores in the Strip District, and I have to admit it was pretty intimidating. I walked in and no one appeared to speak english, there were many grocery items I had never seen before, and I was a good foot taller than everyone else in the store. I perused [since I know Mike pretty well, you should interpret ‘perused’ to read: ‘wandered around aimlessly’] the store for a good half hour looking for things and found nothing I was looking for. So, I brought my phone with the recipe on it to a nice woman at the counter, and she pointed out where everything was. It was a good cultural experience for me and opened up a world of other ingredients I would never have known about.” Don’t you think there is something very romantic about discovering something new about the ethnic culture of someone you care about? Stop Right There! Mike S., welcome to Prince status. Before you put one ingredient in a pot or pan to begin cooking Bibingkang, you have learned one of the Rules of the road towards long-lasting relationship building: knowing about the ingredients and food people grew up with opens up a world of appreciation for the character, the values and the culture of that person. And that knowledge is a strong predictor of the kind of soul mate, friend or co-worker they are, or will become. So this past week, Mike took his best shot at preparing Bibingkang for his special lady, Niezle. according to Mike, Niezle’s “dad makes it really good, but I think mine is pretty close.” Whew! that’s some pressure. Over the weekend, he reported Niezle liked it! But, I could have guessed that outcome, and I’m willing to bet Mike earned some great praise from Niezle about the caring, the daring and the effort more than for the outcome of Mike’s cooking skills with the Bibingkang recipe. Way to go Mike! 1. 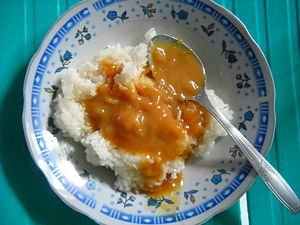 Combine glutinous rice and 4 cups of coconut milk in a sauce pan. 2. Heat and let boil, then reduce heat and cook while stirring until the texture thickens. This process can range from 18 to 20 minutes, or even more. 3. Add 1 1/4 cups of the brown sugar and salt. 4. Stir and cook for 10 more minutes or until the rice is completely done. The texture should be very sticky and plump. 5. Insert half can of thinly sliced Jack Fruit into the mixture with about 1 to 2 minutes to go. 6. Meanwhile, arrange banana leaves in a 9 x13 inch baking pan or dish. 7. Transfer the cooked sticky rice to the baking pan. Set aside. 8. Make the topping by heating a sauce pan and combining 2 cups of coconut cream and remaining 1 cup of brown sugar. Let boil and simmer while stirring once in a while until the texture thicken. 9. Preheat oven to 400 degrees Fahrenheit. 10. Spread the topping equally over the cooked sticky rice. 11. Bake for 12 to 18 minutes or until the topping becomes a little firm. A. This recipe was submitted by Mike Scott, a close friend and cycling buddy of mine. He prepared it for his Girlfriend who has an ethnic background from the Philippines. About 2 years later, my friend Scott wisely married Niezle. I’ll bet it was this cooking feat that sealed the deal! B. This is a traditional dessert but is often enjoyed as a morning or afternoon snack with coffee. 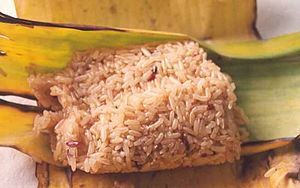 As an aside, glutinous rice is used all over the Asian Pacific countries in many ways and prepared in virtually an infinite number of ways. Very interesting stuff. I’m going to incorporate it into my thinking and recipes. ‹ Chef Ryan Getting Grilled!